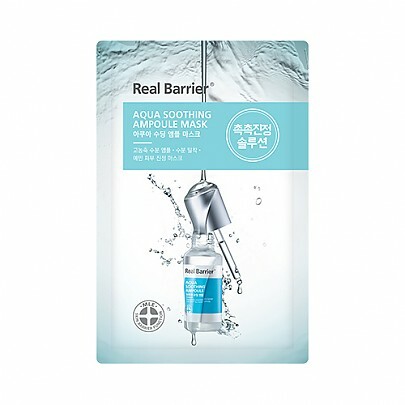 Radiant your Skin Care with the [Real Barrier] Aqua Soothing Ampoule Mask 28ml! we aim to provide you best korean products to take good care of your skin, including Cosmetics, Masks, Mask Sheet. Hydra Mask Sheet online. This paraben free mask is infused with Panthenol to calm, Madecassoside to moisturize and Allantoin to soothe. It also contains Hyaluronic Acid which is known to bind moisture to the skin. The concentrated Ampoules deeply moisturize damaged skin. The black sheet, enriched with Bamboo Charcoal, helps purify skin that has been exposed to and damaged by environmental pollutants. 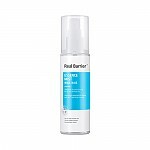 And, the MLE Skin Barrier formula aids in building up and repairing the moisture barrier in the skin. After cleansing, pat dry. Remove the sheet from the pouch and carefully unfold. Apply to the entire face, avoiding the delicate eye area. Relax and enjoy for 10 to 20 minutes. Remove the sheet and gently pat the remaining Ampoule cream into the skin allowing for additional absorption and moisturization.